Up here, biking is a culture. Up here, we bike for fun, we bike to work, we bike to exercise, and we bike to experience the beauty of Steamboat Springs. Steamboat truly embraces its moniker, Bike Town USA and it's time to get up here and be a part of it. Diversity is the name of the game in Steamboat Springs, with something for all levels and all riding preferences. Hop on the family-friendly Yampa River Core Trail for a relaxing cruise along the river, explore our scenic cross country singletrack, or hit the Steamboat Bike Park and downhill trails on Mount Werner. The smooth country roads offer endless rides through the Yampa Valley. With a variety of two-wheeled adventures up for grabs, how will you bike the &apos;Boat? Check out more information on biking in Steamboat below or visit Bike Town USA for details on trails and initiatives. Biking in Steamboat is a lifestyle and a community-wide culture. 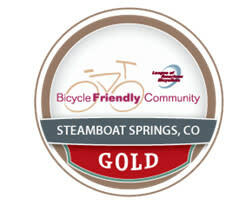 The American League of Bicyclists agreed, naming Steamboat Springs one of 18 cities nationwide to earn a gold level Bicycle Friendly Community designation in 2013. View our biking YouTube playlist for a quick visual taste of Bike Town USA.